On January 18th in 2014, Calgary Flames coach Bob Hartley iced his fourth line brawlers to commence CBC's Hockey Day In Canada finale. 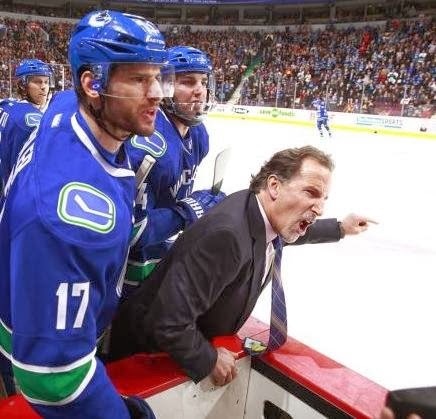 Vancouver Canucks coach John Tortorella reluctantly responded in-kind igniting a line brawl yielding 152 penalty minutes and eight player ejections two seconds into the match. Sensing the imminent ambush, veteran defenseman Kevin Bieksa swapped spots with rookie Kellan Lain to win his first ever NHL faceoff before being jumped by winger-turned-center Kevin Westgarth. Traveling 4,400 kilometers from Oakville, Ontario to witness their son's first NHL game, Kellan's parents instead saw him ejected after 2 seconds of ice-time resulting in a fight and 15 penalty minutes. 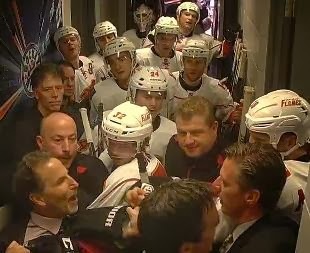 Fuming from the incident, Tortorella berated Hartley on the bench and then met him outside the Flames' dressing room between periods to finish personally delivering his thoughts on the affair; a shortsighted gesture likely to result in a suspension and fine. Questioned about his decision to match Hartley's fourth line bruisers to begin the game, Torts explained he had no choice. "I see the starting lineup and I know the other guys across the bench and it's easy for people to say well put the Sedins out there and it's deflated. I can't put our players at risk that way. With the lineup he [Hartley] had I'm not going to put those types of players at risk. And that's what ensues. I'm not proud of it. 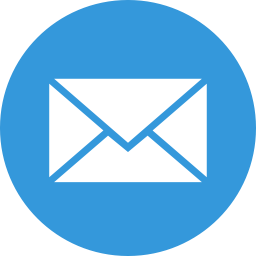 I've apologized to every one of the players involved in it. I don't feel great about it at all. Especially [Kellan] Lain. That's my biggest mistake is putting Lane in that lineup. And I'll kick myself forever not having someone else there but I'd do the same thing again if it came that way because I cannot put anyone else out there not knowing what's going to happen and knowing the other guy [Hartley] across from me." While Torts was mum about the purpose and potential ramifications of his excursion to the visitor's dressing room between periods, Flames coach Hartley described the scene and refuted any suggestion his opening lineup presumed foul play remarking, "those guys are playing well for us, they got us a goal last game, we had absolutely zero intention there". Instigator Kevin Westgarth, on the other hand, was a bit more candid in his assessment of the opening draw, noting the team's struggles of late and his role to "get the boys going anyway I can". Short four skaters aside, the teams played 65 minutes with 204 penalty minutes, collecting 33 shots each and combining for 33 hits with top defensive pairs logging over 33 minutes (including a 38:05 minute effort from Dennis Wideman, the most minutes logged in a NHL regular season game in 11 years), and #33 leaving after 40 minutes owing to injury. The Canucks took the shootout's 5th round to beat the Flames by a final score of 3-2, ending a wild night between the Pacific Division rivals.